I had a good sewing day on Friday as you can see. I finished the last episode, Episode 5 and the Finale. Below is the final project. What do you think? The shapes and pieces are a bit larger than I've been doing lately, but the design is nice. I do like the introduction to the Goddess Tool. It is nice to have several different rulers all combined into one. There are some limitations on sizes that will have you going back to the single rulers. 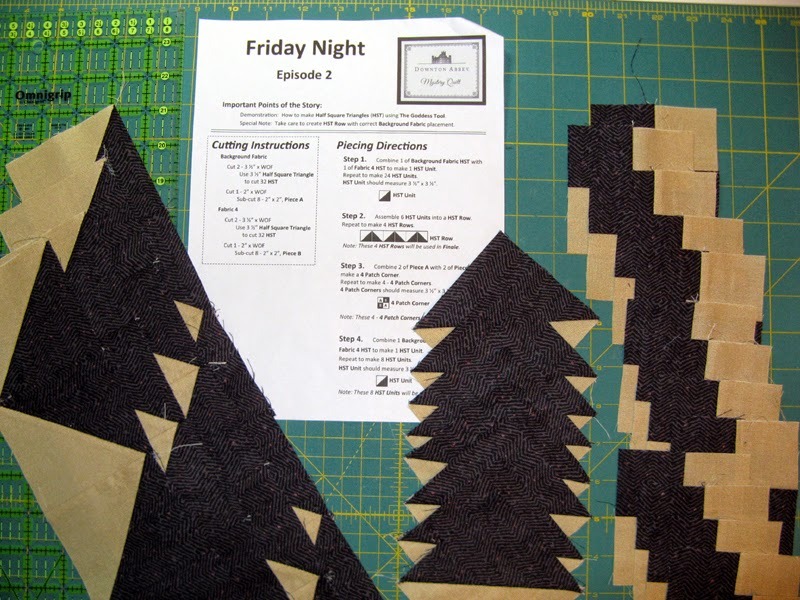 For instances the tall triangle in Episode 5 only allows for a 4 1/2" size. Suppose if that is a common size for you it's a good thing. I do work with the tall triangle although not usually this large a unit. I haven't given much though to the name for this mystery project. Needs to be a mysterious name. Are there any castles or mansions that have a mysterious background that would work? Keep in mind the first letter has to be a "K" or can be changed to sound like one. Okay Janet...you are good at this. These are photos Kerry took of the three sample projects that Tiffany Hayes used for the design reveal. What a difference the fabric makes. I'm working on Kurry today. The last day of January already. My goodness how fast 2015 is moving ahead. Tomorrow is the UFO Parade and the announcement of what project I'll be working on in February. Maybe I can get in a few more Kurry units. Hope your Saturday is a good one. 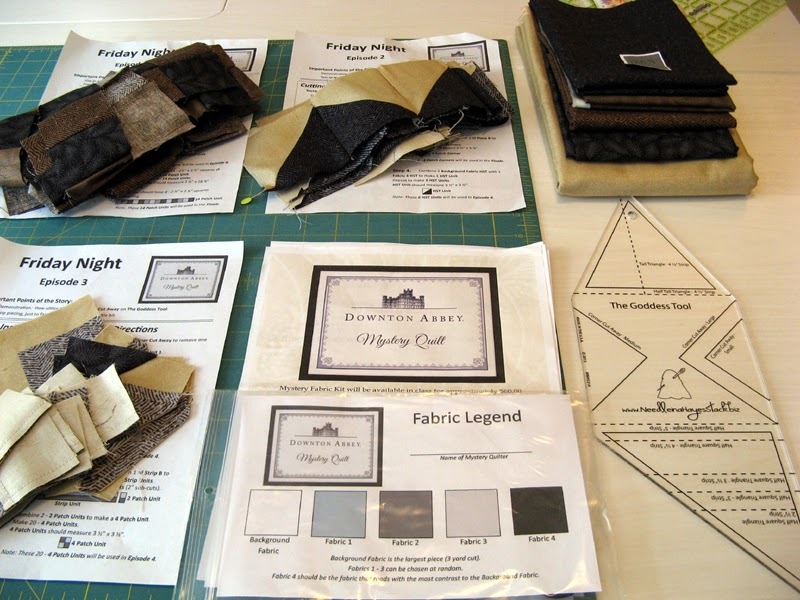 Today I'm working on my Downton Abbey Mystery from the workshop at Road to California Quilt Show from last week. Tiffany Hayes set each part of the mystery as an Episode. Episode 1 is above. I had this one done in in the workshop. Episode 2 was also done at the workshop. Not sure what I was thinking but I made way too many four patches. I guess during all the fun I got carried away! Some how I must have gotten the episode mixed up with Episode 3 because you'll see in it is where lots of four patches were to be made. I ended Thursday night with Episode 4 finished. This is the first of the episodes where the units start coming together. I'll be back tomorrow with Episode 5 and the Finale! Again I will share with you Kookaburra which was a participant in the Traditional Large Pieced category at the 2015 Road to California Quilt Show. The program cover and information first. 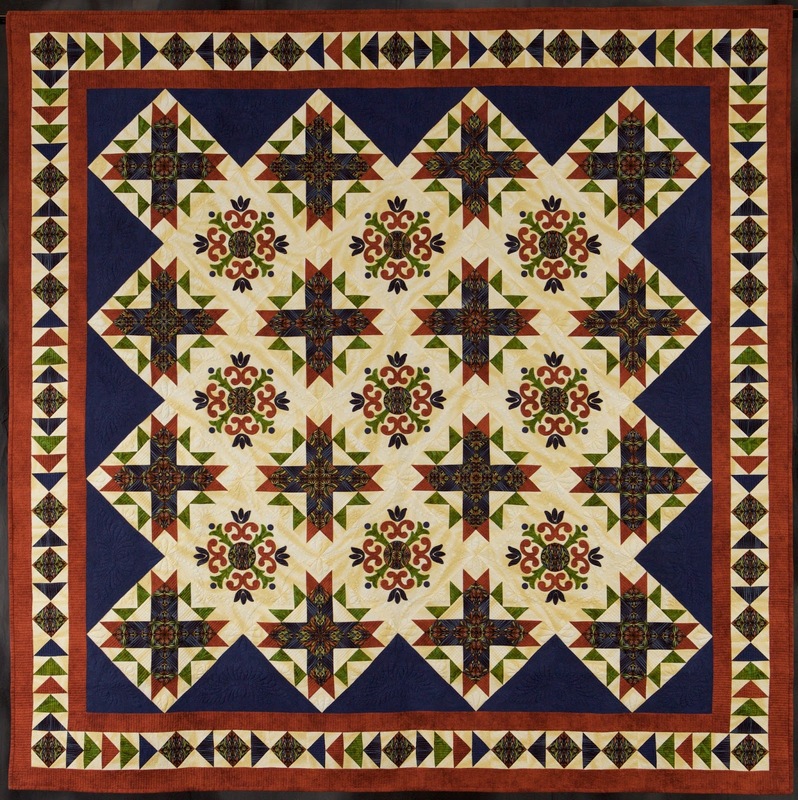 Kookaburra was among 24 outstanding quilts in the category. I heard it said from show organizers that it ranks as one of the most outstanding of projects to be entered. Competition was tough, even for the judges. A note before you scroll down too far... The photo of the Judge's Choice is horrible. The fabric selection was very different, but it worked. I wish to have had a better photo. I think the Judges made the right call. 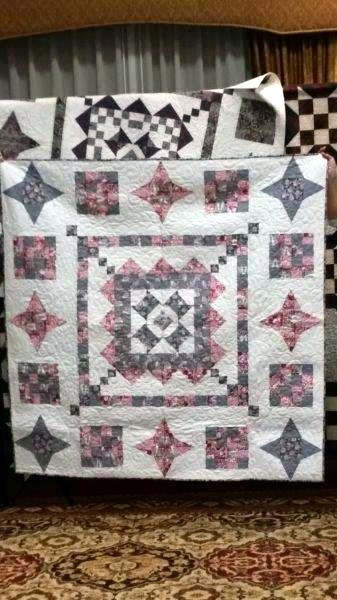 The piecing in 1st place was excellent, but I felt it was entered in the wrong category. 2nd place would have been my 1st place call. I can't share the remaining 19 so next year if you can try to make it to the show. It is always the third week of January. 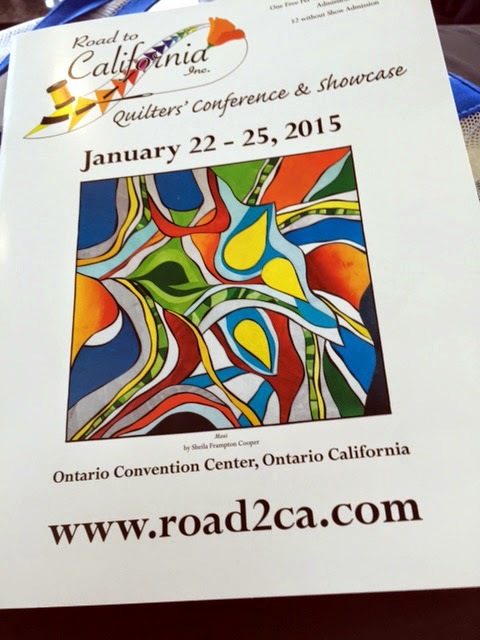 I spent Thursday through Saturday this past week in Ontario, California at the Road to California Quilt Show. I brought home all kinds of patterns and some fabrics for them. Kurry needed a few more yellows and blues. The fabrics that are positioned a bit lower on the top row and the one under the dark purple should be able to accomplish the requirements. Now to get to the sewing. I'll be working on this one this week and until February's UFO project has been announced on the 1st. This is a very cute "sewing book" that I picked up. The design is by Lynette Anderson. The embellishments are all sewing related. Notice the reindeer on the green fabric? Just way too cute not to bring home. I will be using the light green on the top for the "sewing book" and the other two for a Christmas theme Buggy Barn Design that I have on my want to make sewing list. 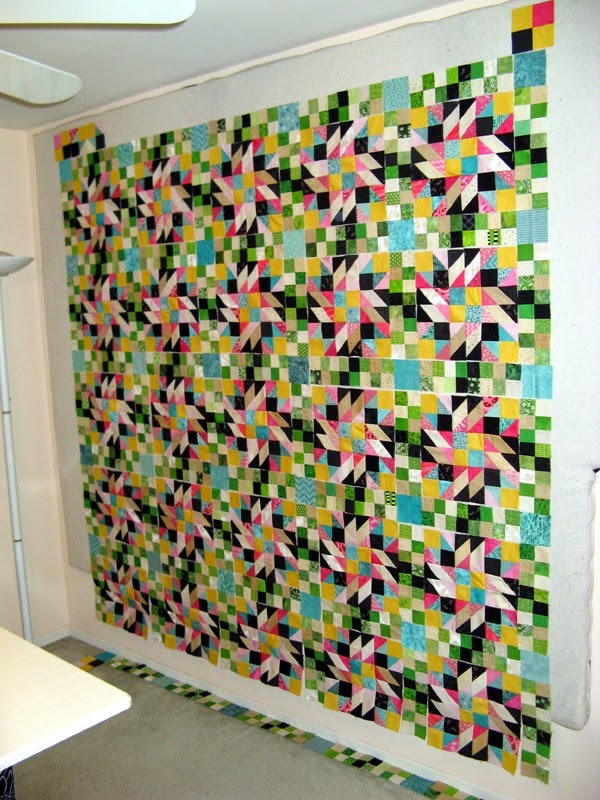 This project is 46" x 56" and perfect for little 4-patches. 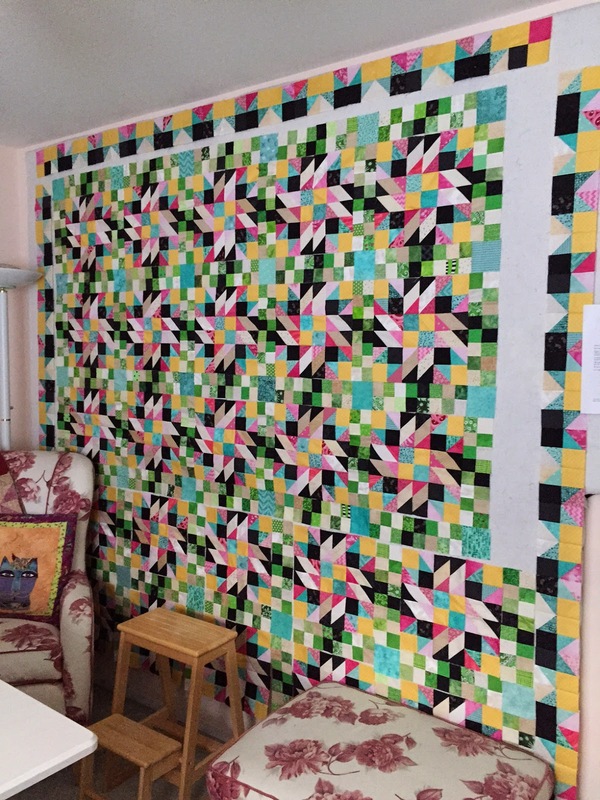 It is called "A Quilt for Mrs. Chalmers" by Em and Me Designs. I will be using the cheddars for it. 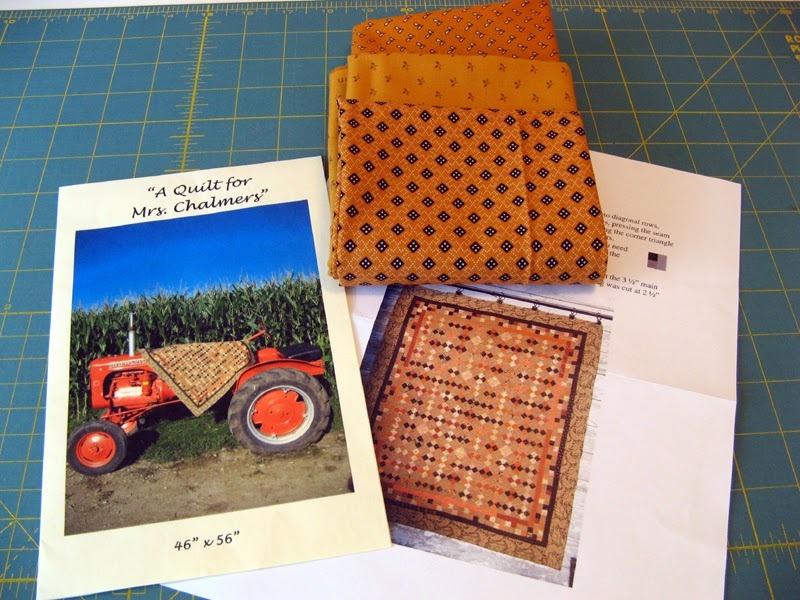 The tractor holding the quilt is a shinny orange. 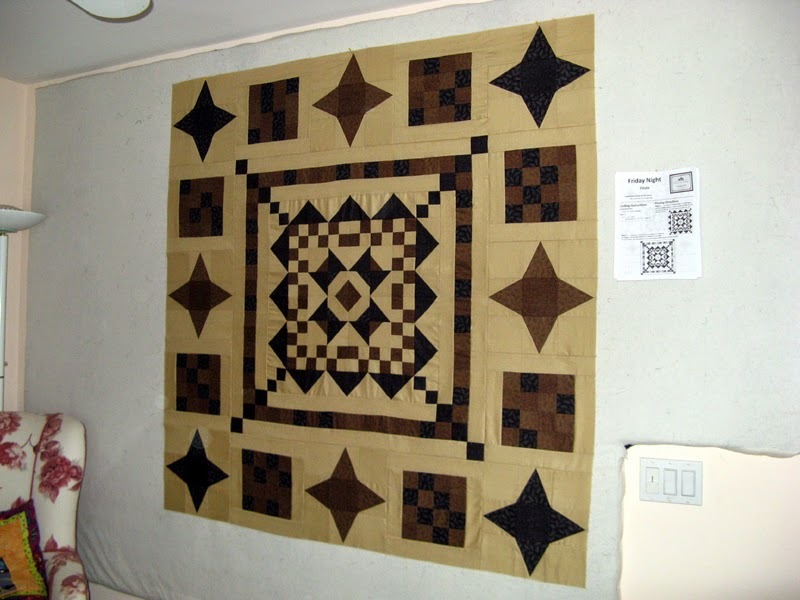 Doesn't show much of the quilt so I pulled the instructions so that you could see what my eyes happened upon in their booth. I didn't purchase any fabrics for these patterns. 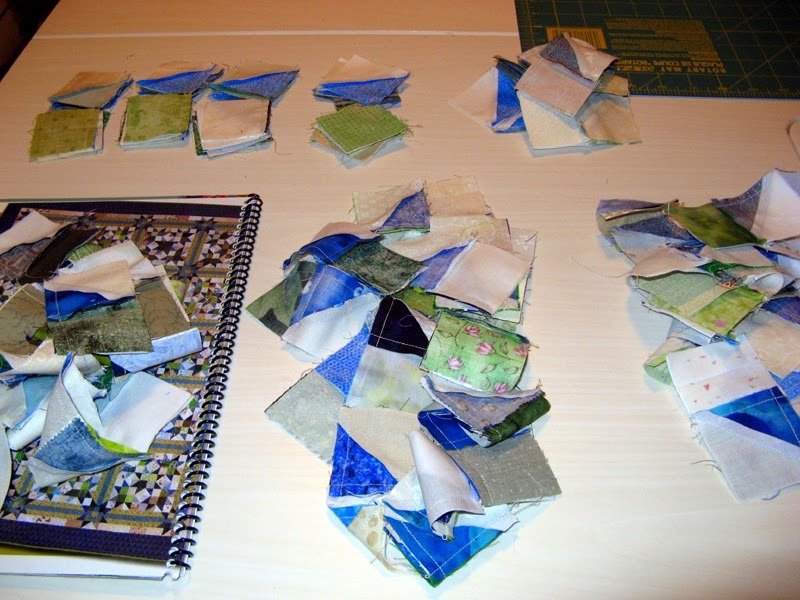 I had in mind using scraps. The projects are small except Rainbow Radiance. There will be more on these projects as I get to them during the year. 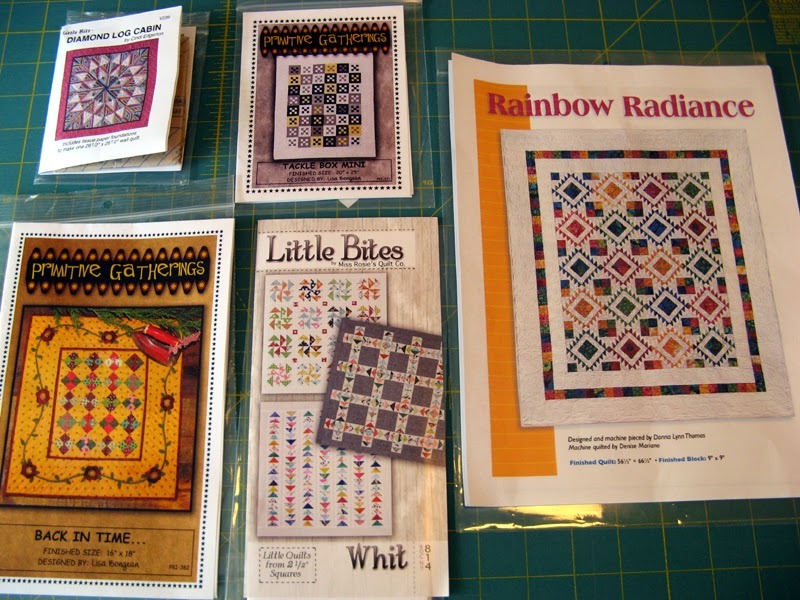 I purchased Rainbow Radiance and the On-Point Patchwork book from Donna Lynn Thomas at her workshop. I nearly accomplished one block during the class. I put the final parts together after the class in my hotel room. Using the Omnigrip On-Point ruler is pretty neat. I like many of the designs Donna Lynn has so I'm thinking I'll give this ruler a go on another of her projects. The last class was a mystery by Tiffany Hayes. It was called Downton Abbey; featuring the fabric line. Tiffany uses the Goddess Tool for her projects. She mentioned this was her first every mystery. She did a great job in my opinion. There were 36 in the workshop that was from 6pm to midnight. The evening was started with a lottery on the kits, all of which were named after one of the characters in the popular television show now in its fifth season. Mine is the Lord kit which are primarily manly prints. I finished the first three episodes and have two more yet to go before the finale. Kookaburra was displayed nicely in among the other quilts of its category. There was some stiff competition this year. 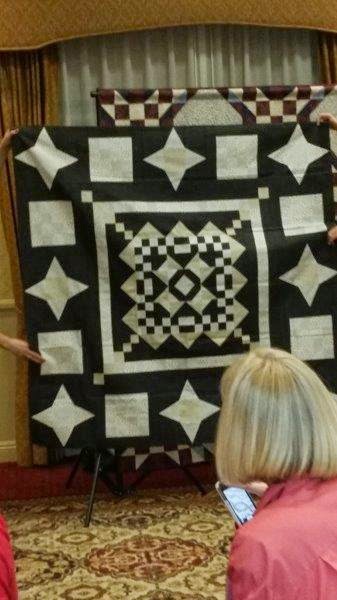 I do agree with the judging the winners created some beautiful quilts. You will have to stop in from time to time and see how my new projects are coming along. 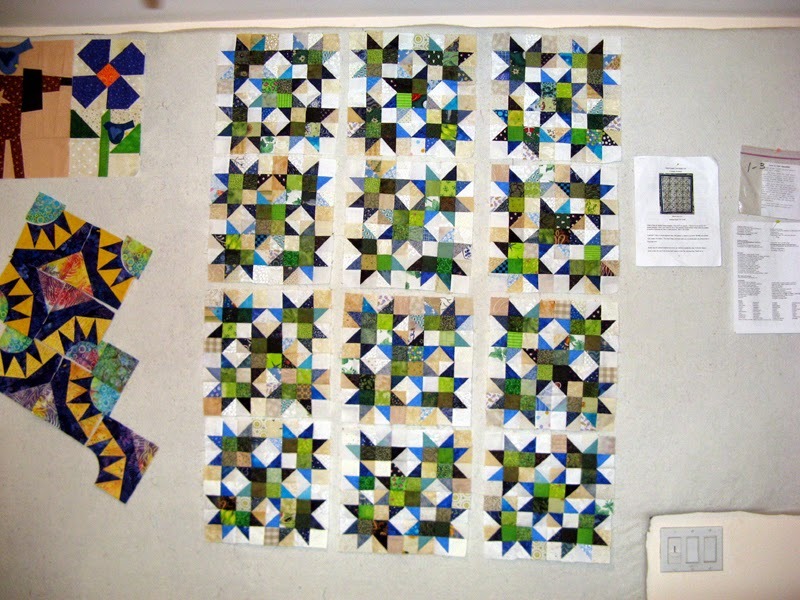 Have a wonderful week and if you have time see more projects through the links at Patchwork Times. 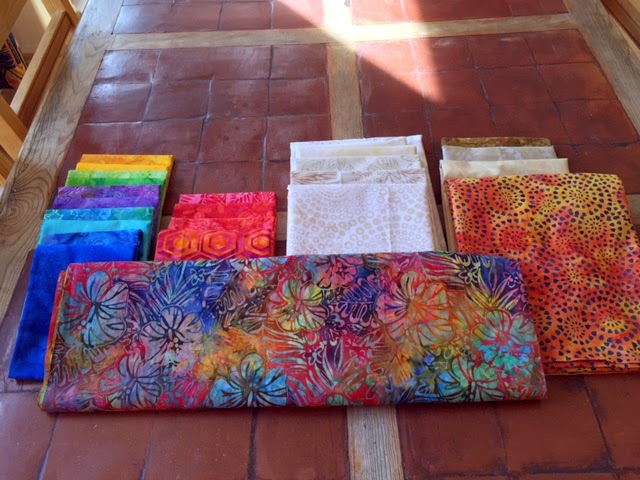 Let's start with all my fabric purchases at Road to California... 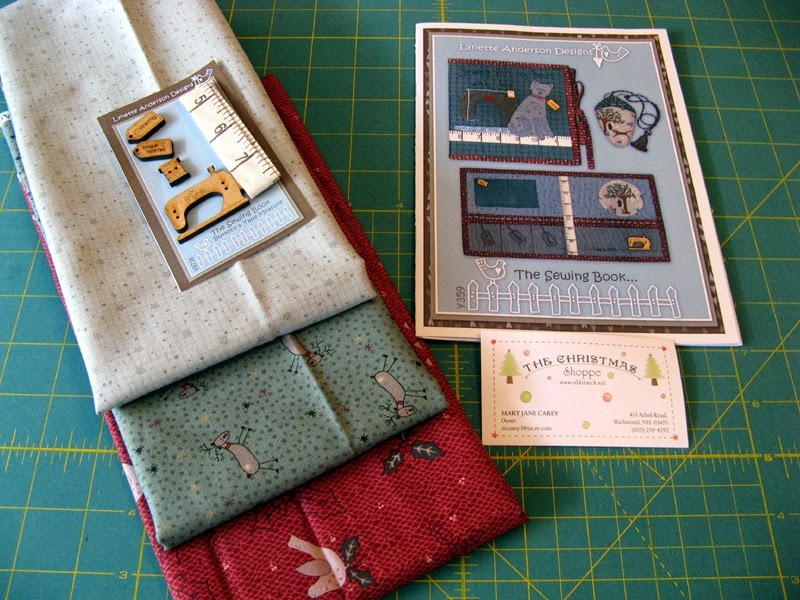 I purchased a FQ bundle to get the 14 you see on the left. These won't take very long for me to use. Neutrals are a must with scrappy projects! Next up are FQ cheddars and a 1/2 yard yellow. 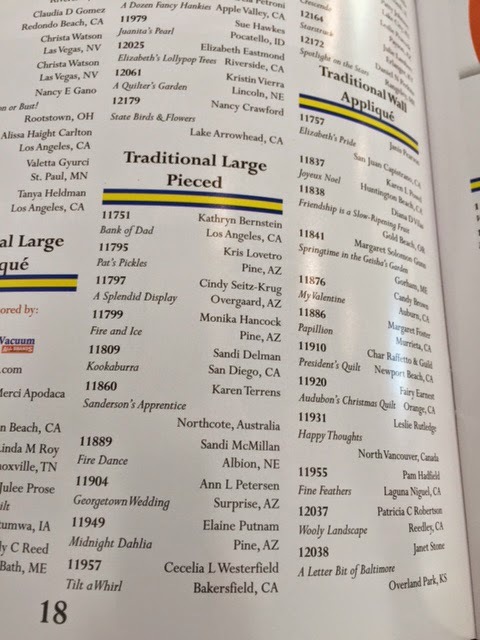 I picked up a pattern while I was at the show that will use the cheddars. (I'll share patterns tomorrow.) 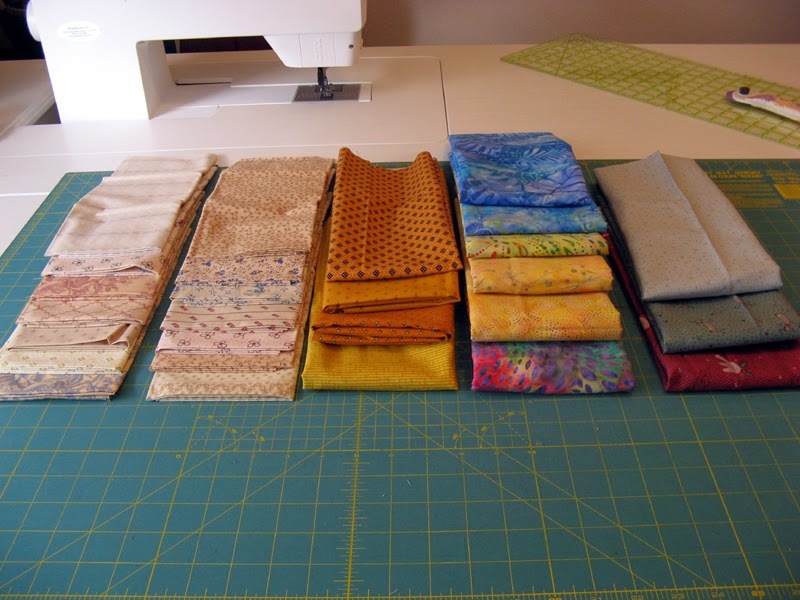 Next up fabrics for Kurry; I needed a few more blues and yellows to complete the look that I am working to achieve. The multi color will be part of the consistent design that runs through the top. 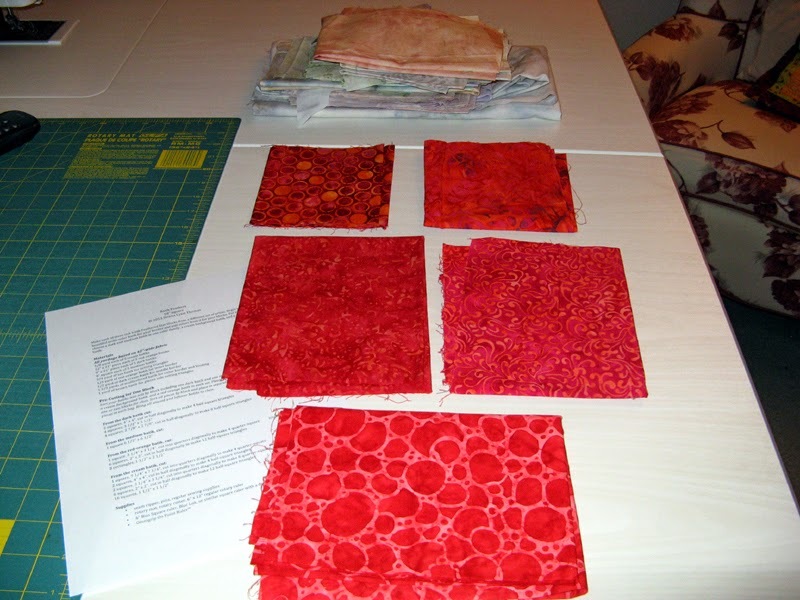 Finally, more FQs for another of the patterns that I purchased. I'm certainly looking forward to using these fabrics. I knew I'd have a heavy "purchase" week and really hoped to finish my Grand Illusion to offset the add. Well you can see that I finished Kadabra... The teal fabric that I thought to use for the inner border just didn't work so yellow it is. 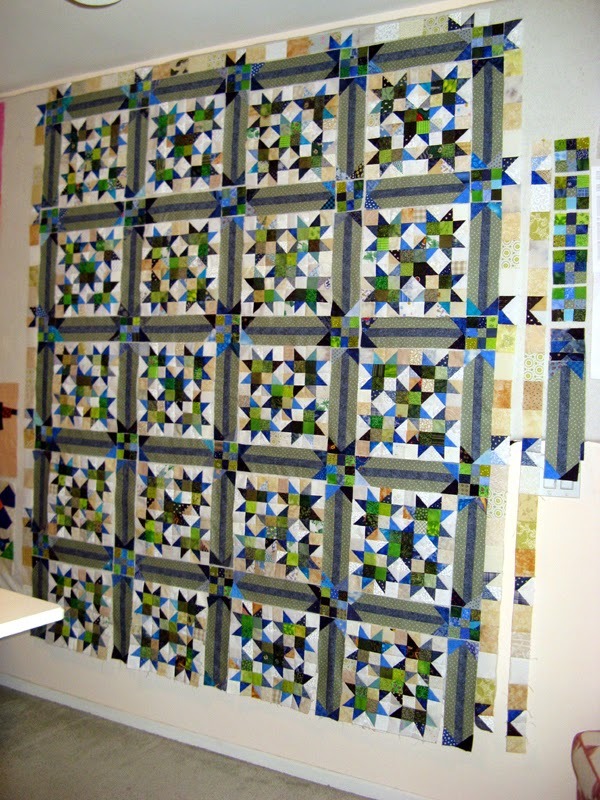 I am thinking to use the teal for the binding. We shall see what will be after it is quilted. Here are my stats for this week. Hope your day was perfect. 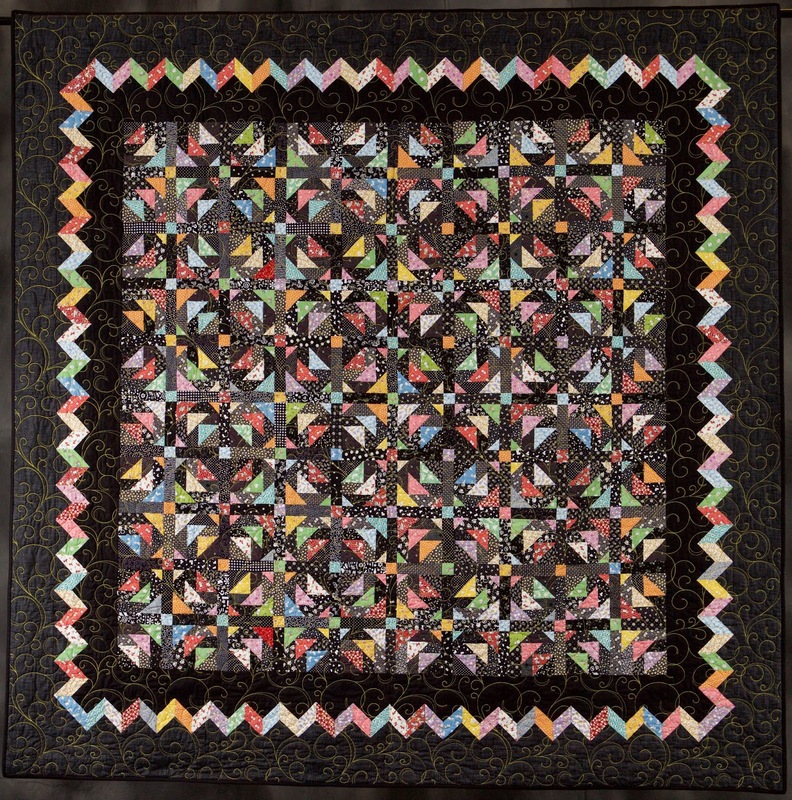 Patchwork Times will connect you to other quilters using up their stash. 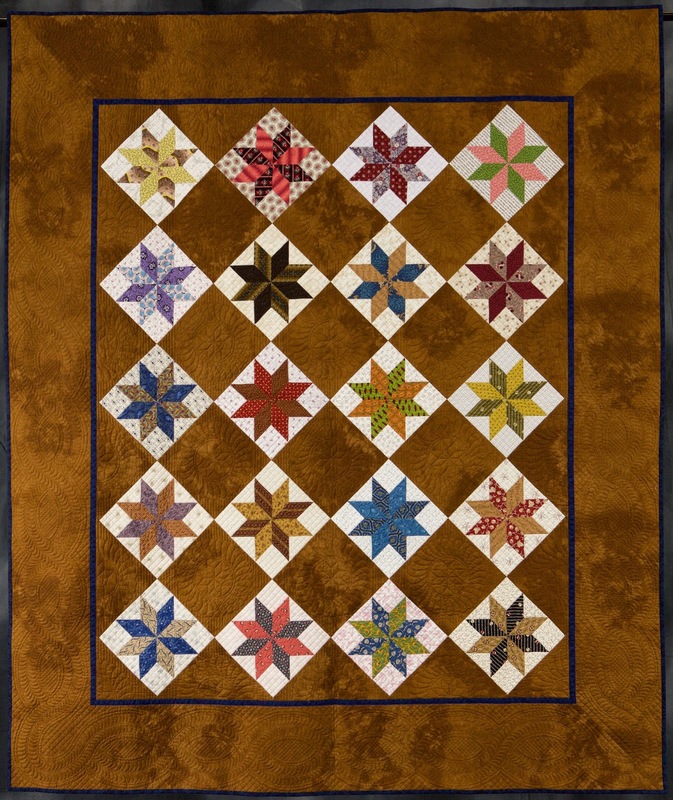 I am leaving my sewing room for a few days to take in the awesome 2015 Road to California Quilt Show. Kadabra has a bunch of rows sewn together right now. 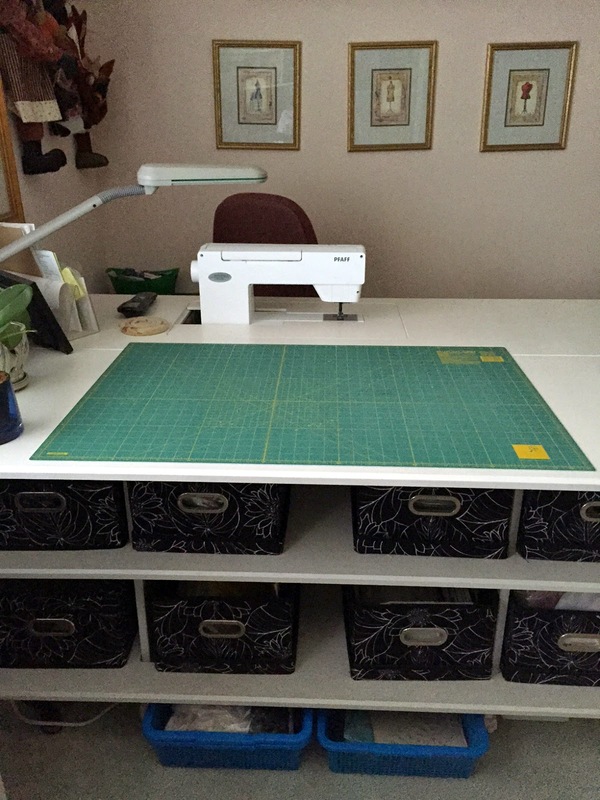 Does my sewing table look lonely or what? I hope to post on Facebook some of the sights of the show and what I am doing in the workshops I will be attending. Do not worry if you are not a Facebooker...I will be showing photos once I am back home. 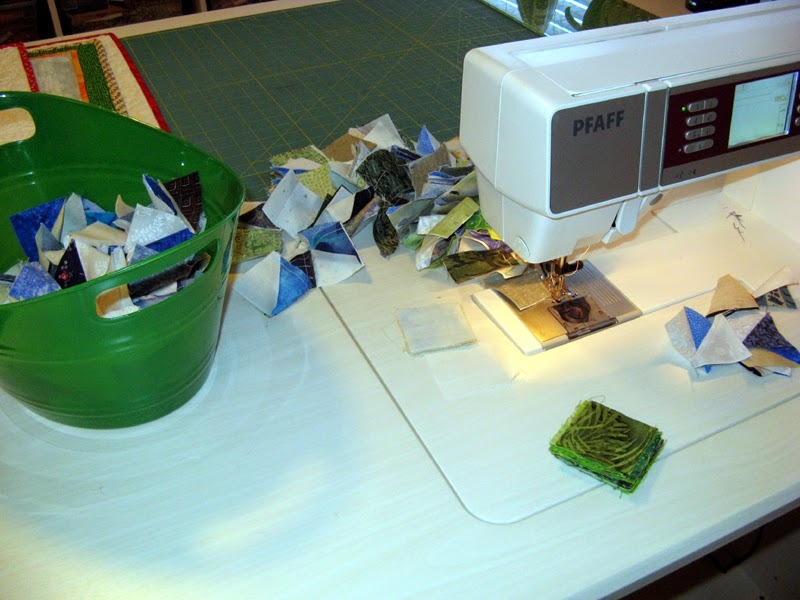 My sewing room will not look like this just after I get back! I had an accomplishing Sunday with Kadabra. I kept up with Bonnie Hunter's parts throughout her 2014 Winter Mystery Grand Illusion. When it came to assembly though I needed to focus on my January UFO. With Kool Krystals done (January's UFO - #2) I shifted gears back to Kadabra. Oh by the way, Kadabra is one of my 2015 UFOs so I am soon to be one up for completing the 12 on my list! Kadabra is one big project. 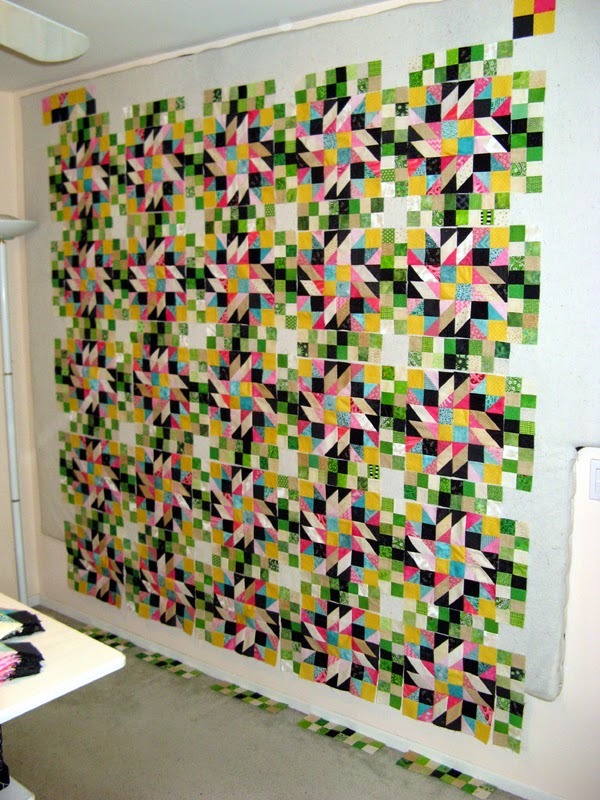 It has taken up my entire Design Wall and part of my floor until I can get the rows sewn together. I love the way the outer border looks. Below the polka dot will be the inner border. I used some of the backing fabric since it matches so well and is somewhat less busy than all the wonderful scrappyness throughout. I'll be anxious to get back to Kadabra tonight. 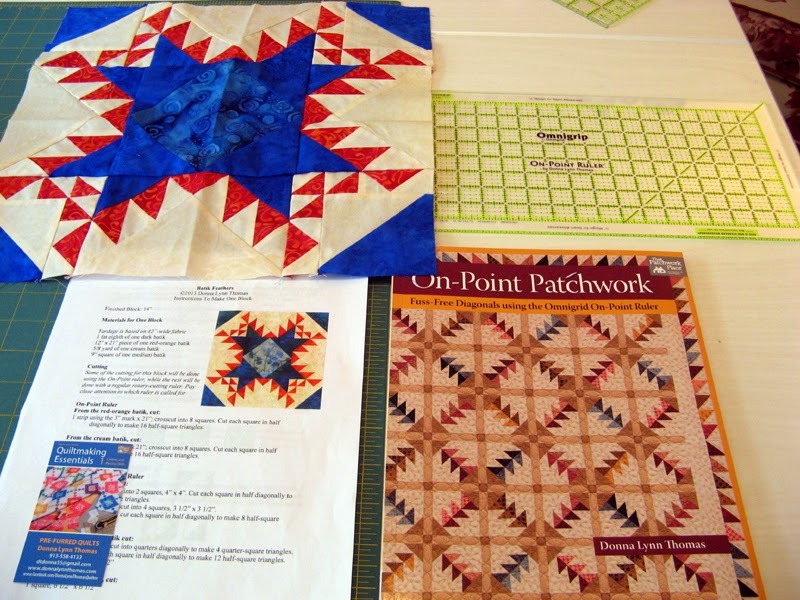 There are many more projects to be seen through the links at Patchwork Times. Let's start with the good news...I have a finish with Kool Krystals. I'm sure liking the results. 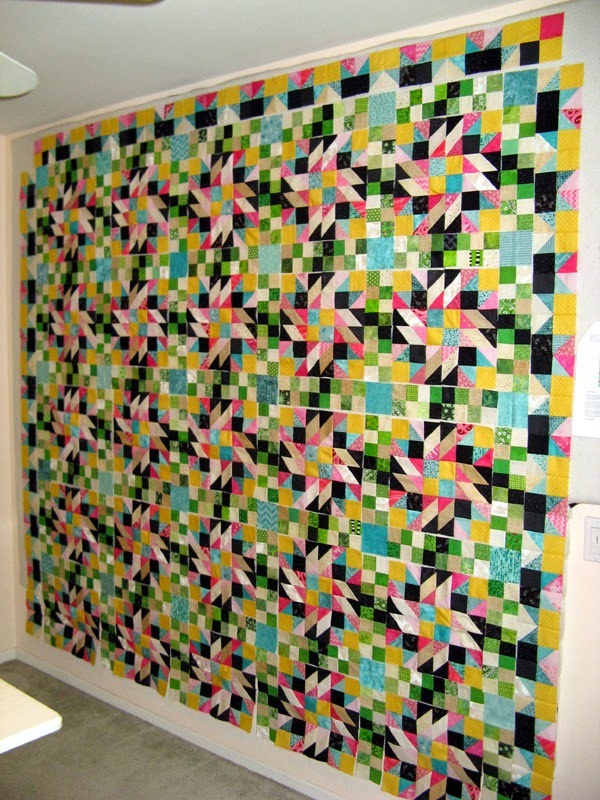 This is a big quilt coming in at 75 x 90. Bonnie Hunter design called Scrap Crystals. That strip you see on the right will be put into the back. I like to use all the pieces from a project. If some end up on the back, well so be it! Below is the back fabric. I'm happy to have had it in my stash. The color and design couldn't have been a better choice. Next the fun stuff...I went to Beverly's and Rosie's on Friday to get fabrics for one of the two workshops I'll be attending this coming week at Road to California. Yep...went off the deep end! 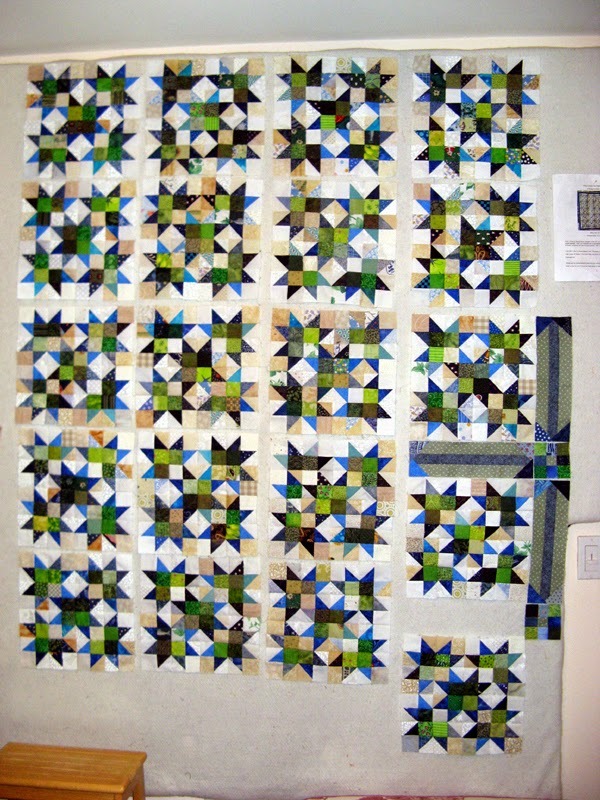 The big piece across the bottom will be the border. 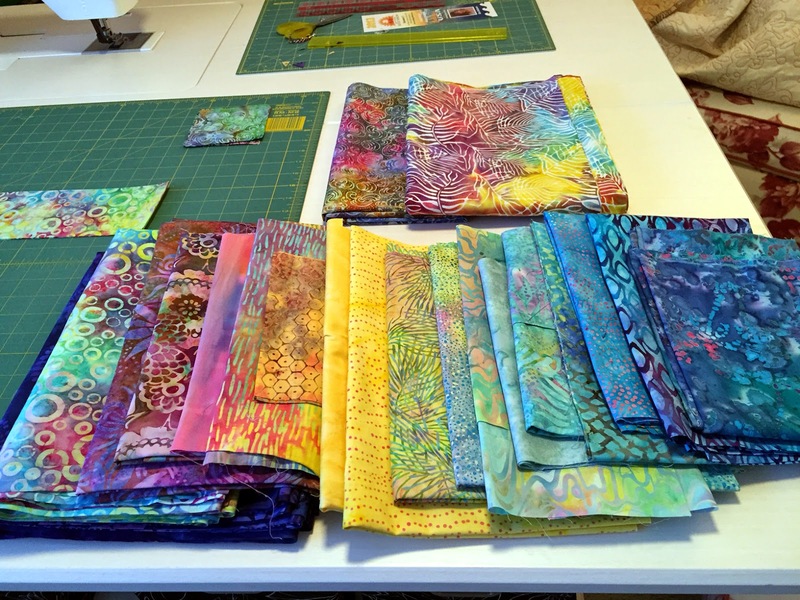 Everything else will go into this project called Batik Feathers by Donna Lynn Thomas. Sure happy to have Kool Krystals offset my purchase this week. 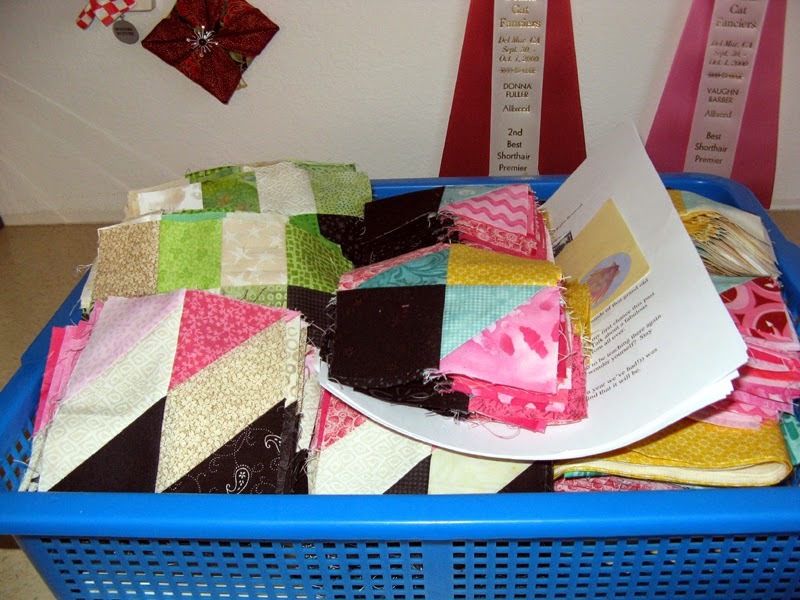 See others using their stash through the links at Patchwork Times. I don't have enough Design Wall to put all of Kool Krystals up! The pieces to finish the bottom are on the right. All units are sewn together; now it's time to assemble the top. At first I thought I didn't like the look of the sashing. After making more units and putting them on the wall, my mind was changed. 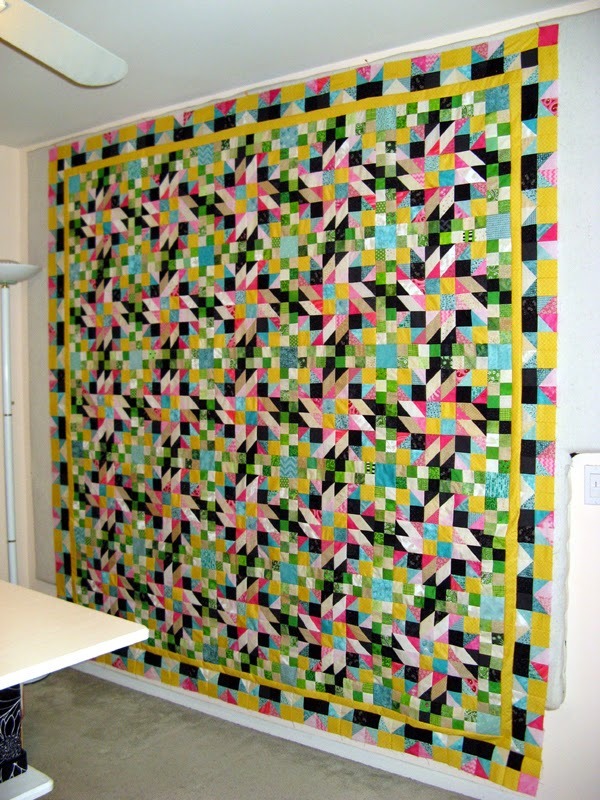 The design by Bonnie Hunter (Scrap Crystals) calls for an outer solid border. Still not sure I will add it to my project. 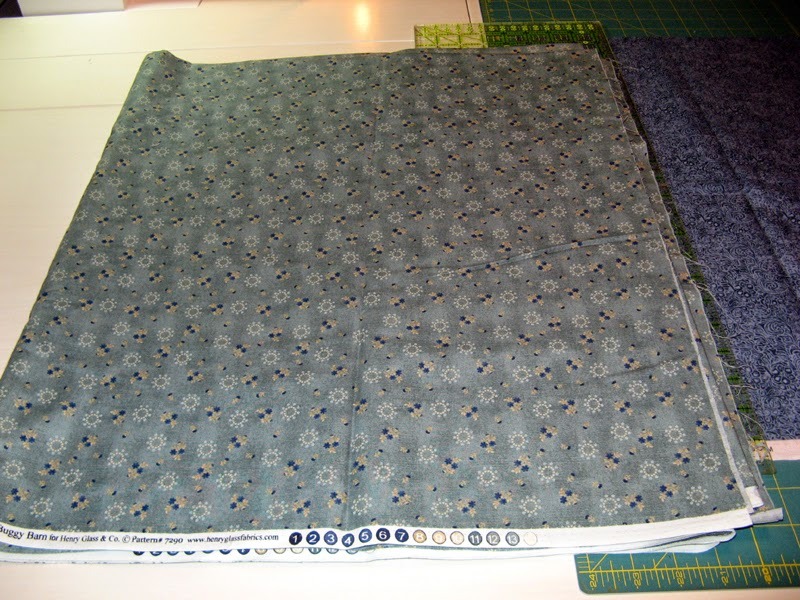 Once I have it all assembled I will audition using the blue in the sashing for the binding and forego the outer border. I took a little time on Sunday to pull red-orange batiks and neutrals for a workshop I'll be taking at Road to California in a couple of weeks. The workshop will be led by Donna Lynn Thomas called Batik Feathers. The supply list calls for cream (instead of neutrals), dark and medium batiks. I may try to find something cream between now and then. I've used these neutrals for several other projects and to be honest I'm getting a little border with them. Tonight hopefully the Oregon Ducks will pull off a win. Friends are coming over for the game and dinner. 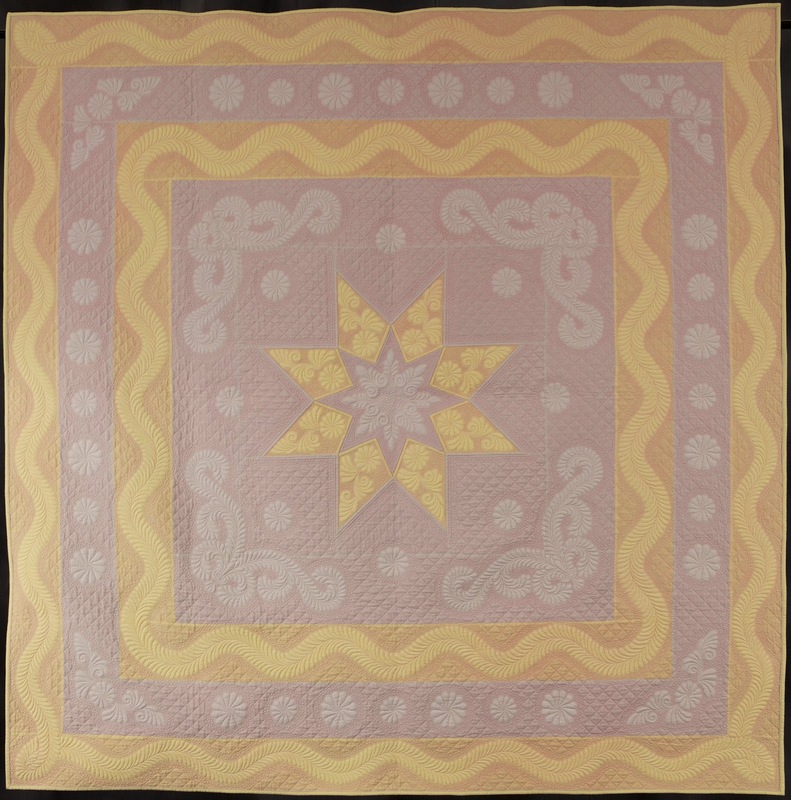 Tuesday night there is Sunshine Quilt Guild. 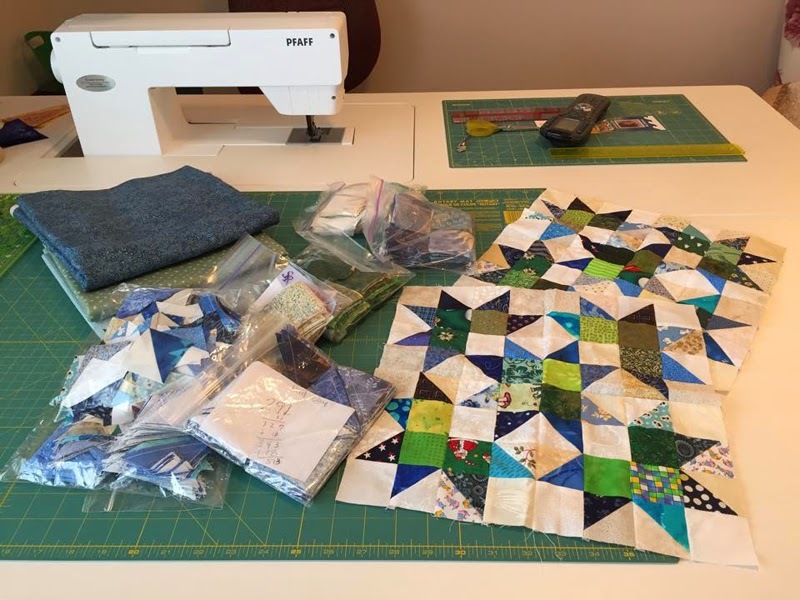 I won't be getting back to the sewing room until Wednesday... See what is going on in other sewing rooms around the globe through the links at Patchwork Times. Kool Krystals starts here this morning. I made quite a bit of progress since last week. The sashing goes quick as do the 9-patches. 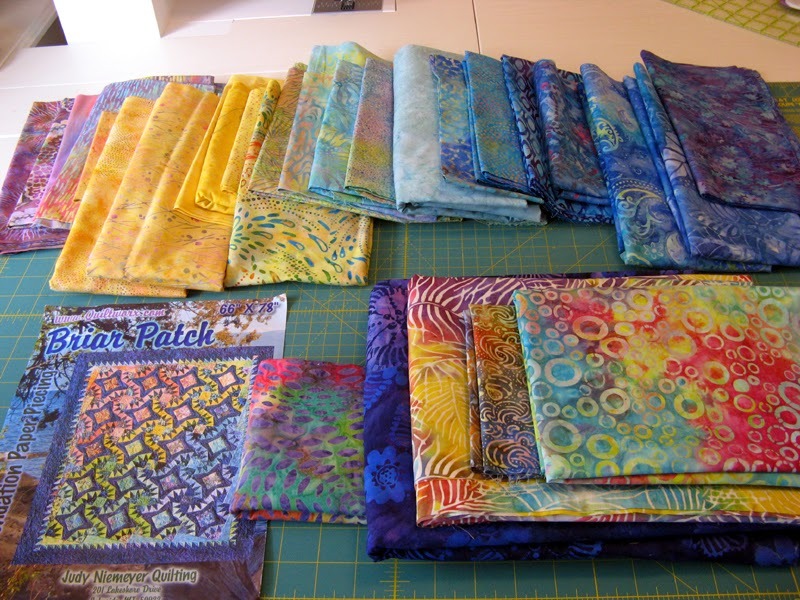 At last count 15 more sashing units and six more 9-patches to assemble. 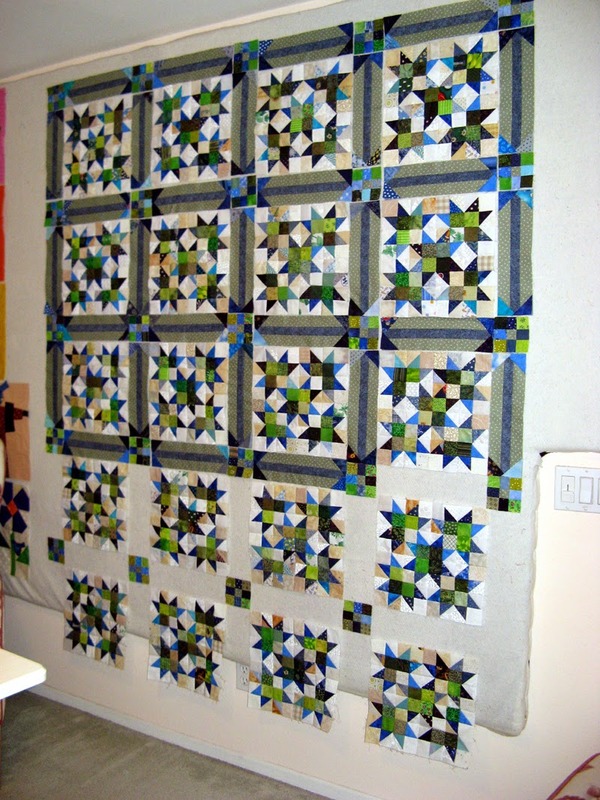 Then there is an outer pieced border to finish off the stars. 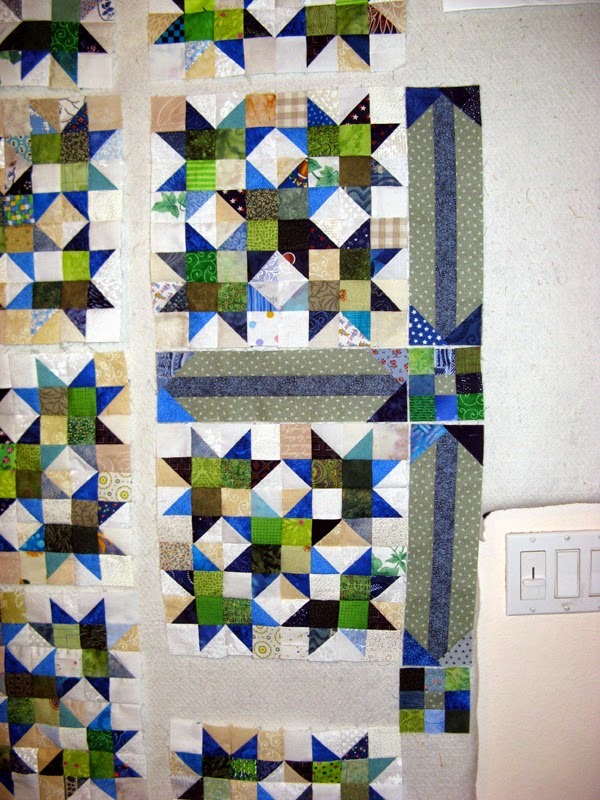 There is also a solid outer border that I will probably not add...we'll see how well it ends at the pieced border. Nothing for week two of 2015 stats to report. We have a rainy day in San Diego today. It will be good to work on Kool Krystals, watch some football, and listen to the rain that hits the gutters. Looking forward to changing these stats next week! Good progress today on Kool Krystals. 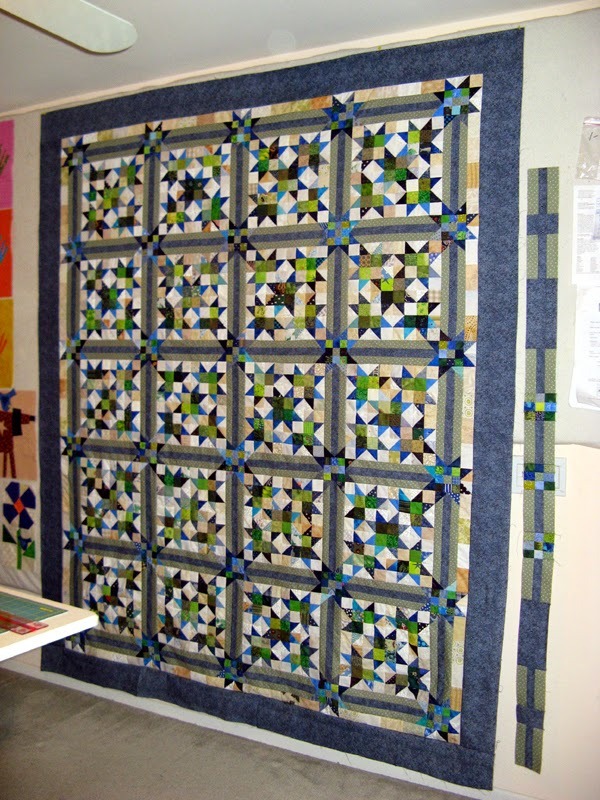 I have all 20 blocks assembled...not pressed yet :( The sashing is started and so are the 9-patch corner stones. 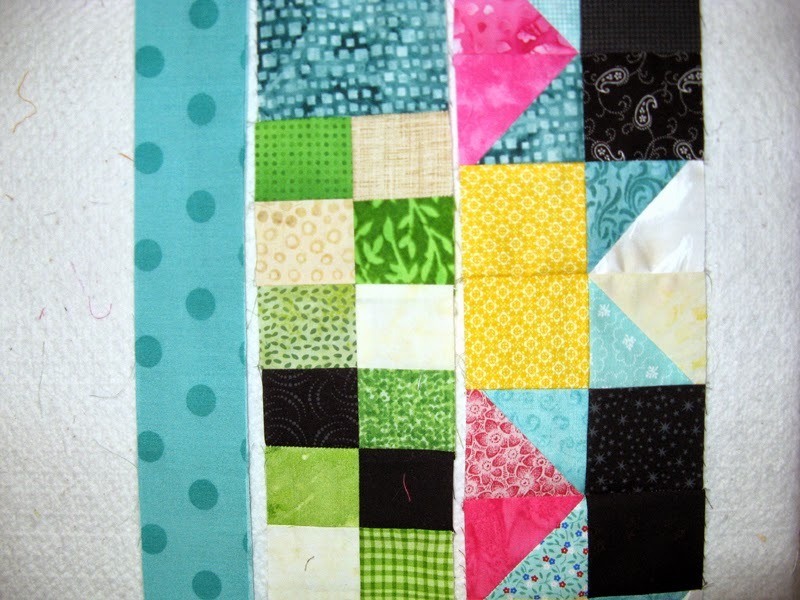 I will be doing the 9-patches with 1 1/2" squares instead of the faster strips. 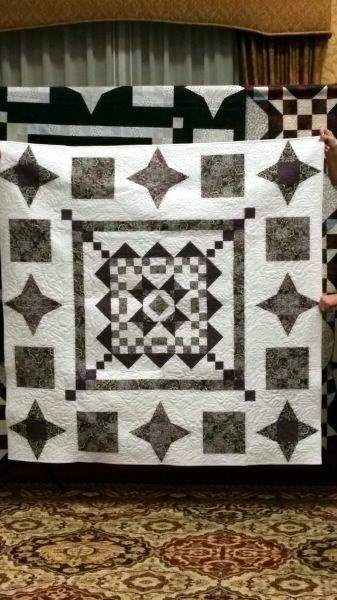 I have so many 1 1/2" squares that it is a great opportunity to carry on the awesome variety that I already have in the HSTs and sashing corners that you can see form a star when connected to the 9-patches. Kool Krystals with 18 of the 20 blocks complete. I can finish three in an evening after work and kitchen duty. Three were done last night and the other three this evening. Just two more to assemble. 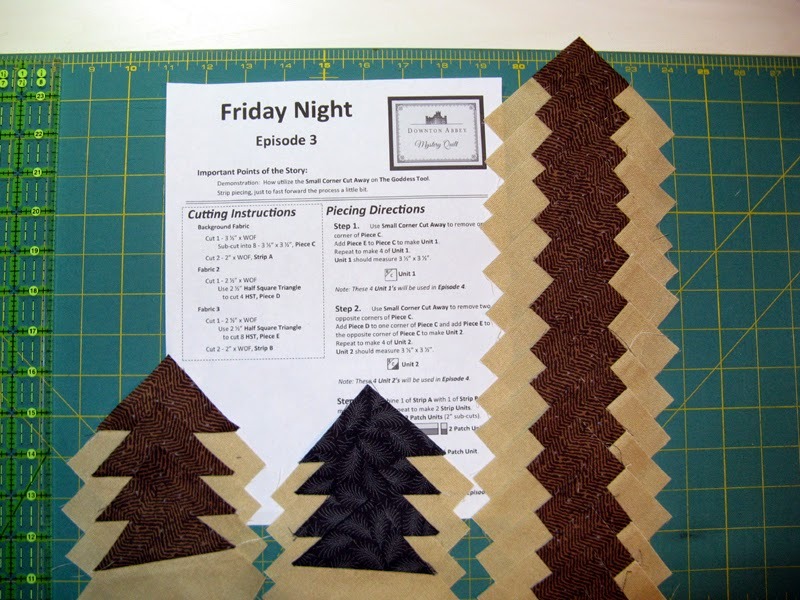 Looks like I am on track for starting the sashing tomorrow night. Oh don't worry about the unit second in from the bottom in the photo below. It is sewn together already and all the others aren't. 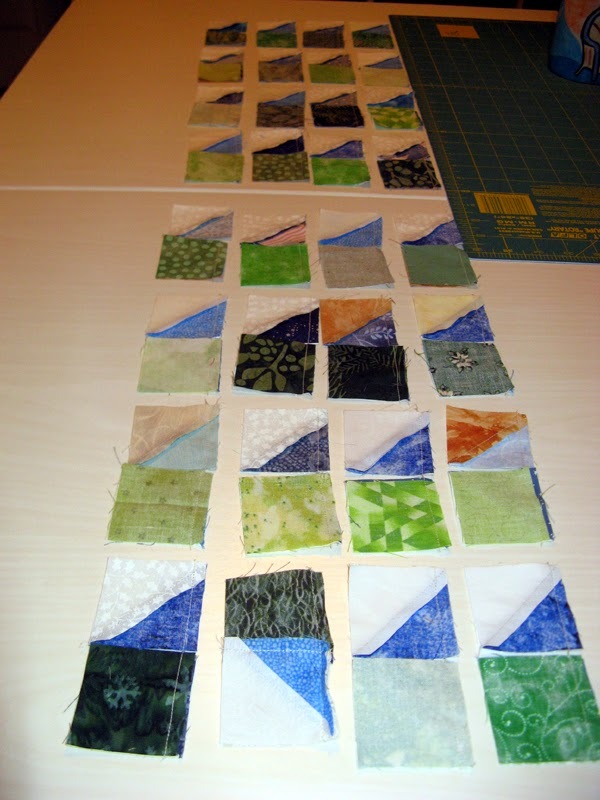 I am trying not to put too many of the same fabrics in a block. I have some progress to show on my design wall since yesterday. Three more blocks assembled leaving eight more to go before sashing on Kool Krystals. The three groups of units at the bottom are ready for final assembly. The five groups at the top still need more HSTs. 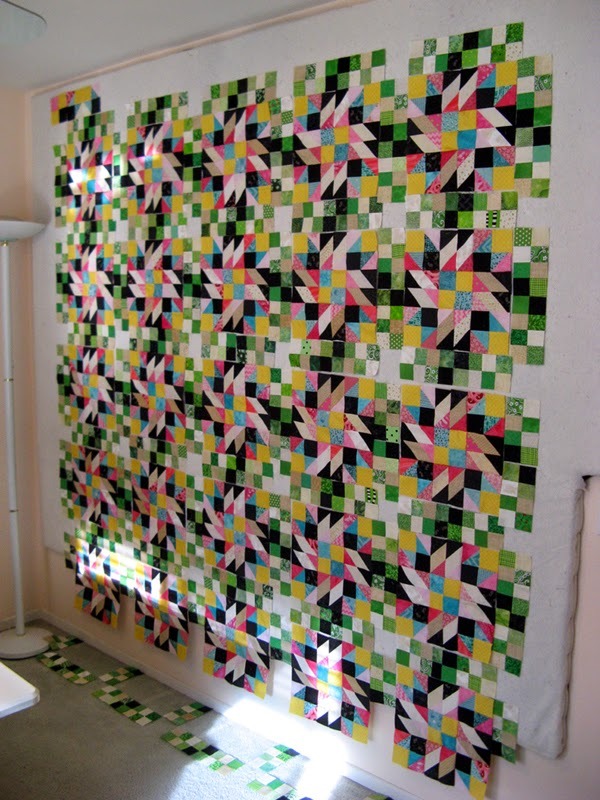 Did I tell you the pattern required 684 HSTs? I have them ready to be trimmed during my lunch break today. Possibly another three units will be assembled tonight. 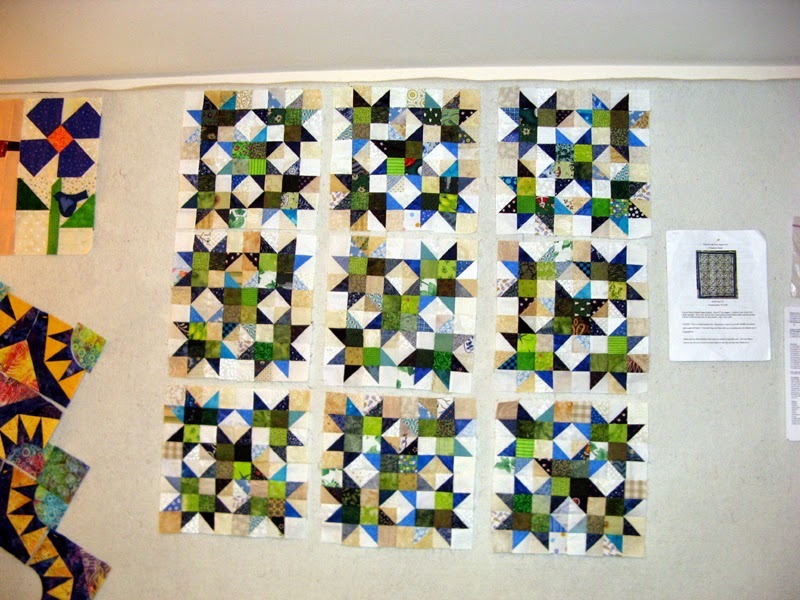 I'm starting to get antsy to see how the fabrics I chose in November at Memory Lane will look next to the blocks. I have made a bunch of progress towards my January UFO. Looking to get back to Kadabra and Kurry very soon (see progress HERE). 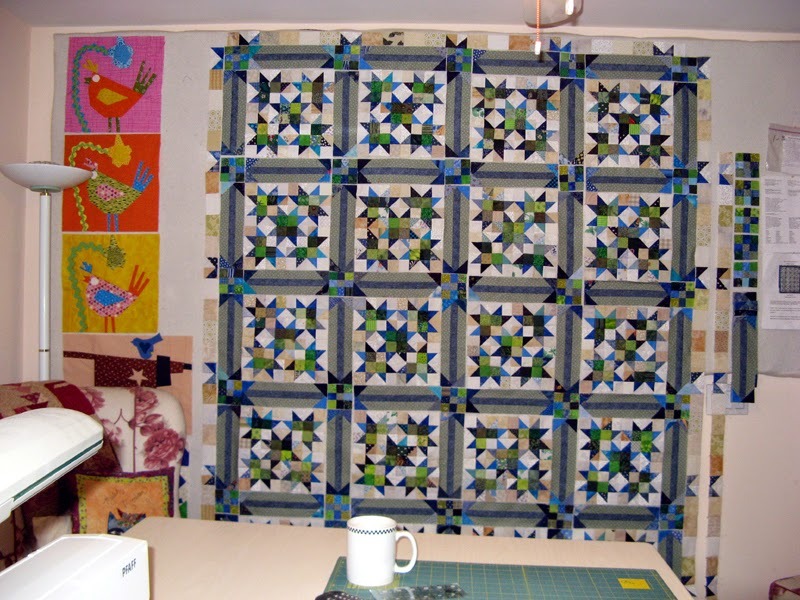 Hope that you find time to visit Patchwork Times to see what else is going on in other sewing studios. A new year and a new stash record... I think my stash moved in and out very nicely in 2014. I took more from it than I added which is a very good thing. Even with all the new projects started and completed my stash treated me positively. I think part of the trick is to build a pattern around what you have and not what you lack. 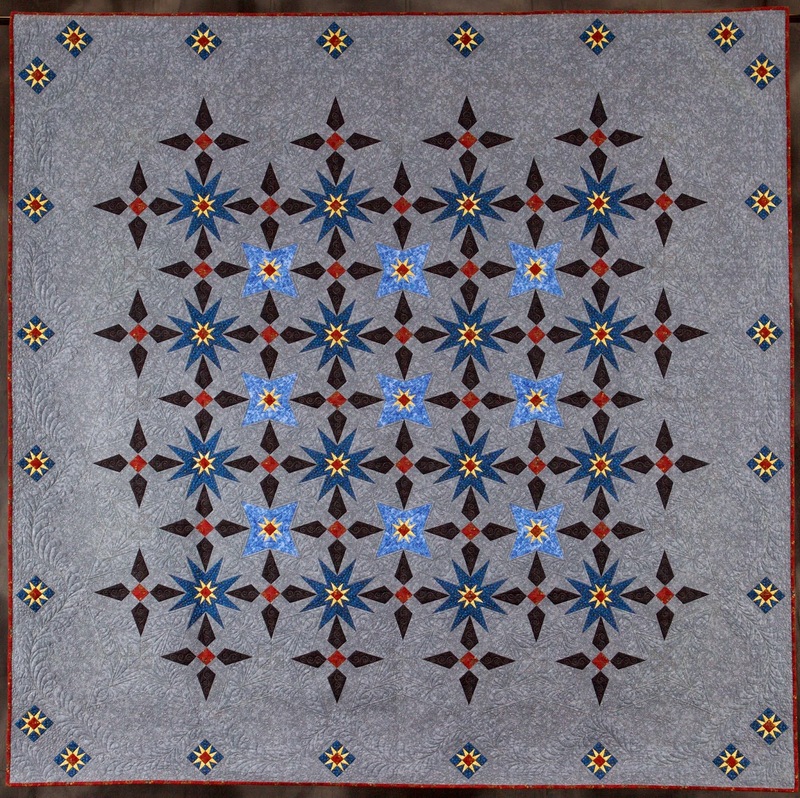 Of course it is necessary at times to visit your local quilt shop or one of the online shops for a fabric that you lack or just because... 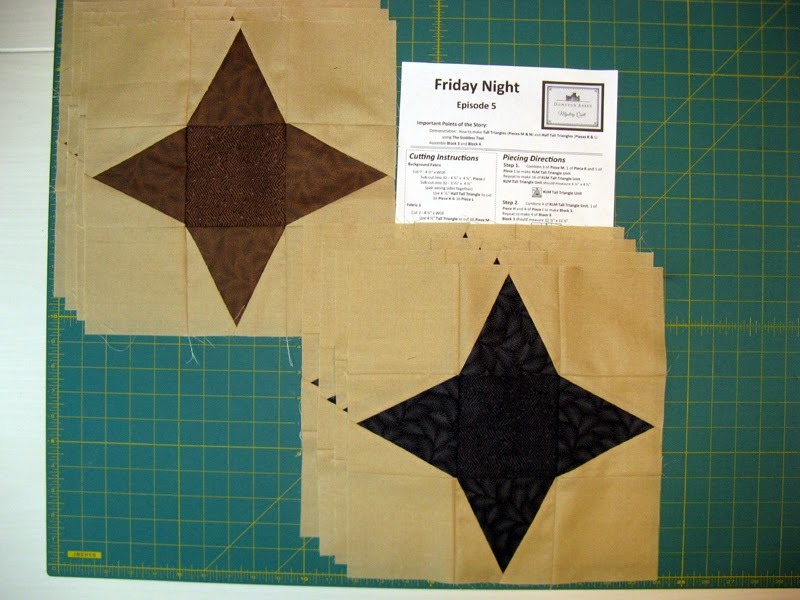 Treat yourself to those five yard pieces during sales for the back you'll inevitably need or the neutrals that are required with nearly every project. So you wonder what is kwiltnkats working on this very first week of 2015? To start off with, but now put to the side, is Kurry. Yes finally started! This is the last old UFO that didn't finish when it was supposed to in 2011. I takes an array of fabrics colors that you can see my project will include dark pinks to yellows to light teals to blues. (The two at the top are consistent in the layout as is the first two on the left.) I'm short on blues even after robbing Kerry's stash. This shade of blue batik isn't so easy to find. I have been to three local shops already searching, but so far no success. There are a few more shops in the area before I throw in the towel. Kurry will be my filler project for awhile. I definitely want to keep up with my 2015 UFOs. Kadabra units are all done. I caught up before the reveal last week. It will wait its turn for assembly until after Kool Krystals finishes. Kool Krystals, my January UFO, is coming along nicely. Boy oh boy are there a lot of 2" HSTs to make and trim down. Somewhere close to 700 units are required. Once these are accomplished chain sewing makes swift assembly. 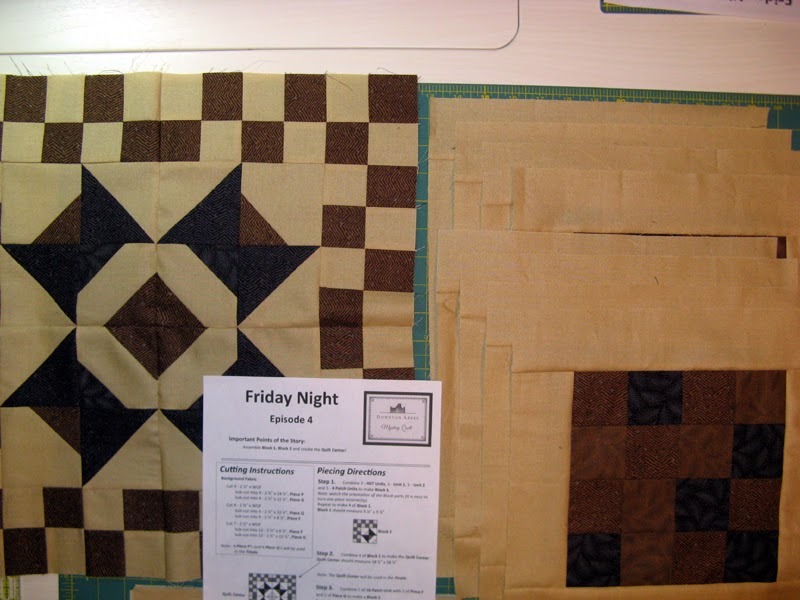 I started the weekend with two block complete from a workshop in November 2014 with Bonnie Hunter. 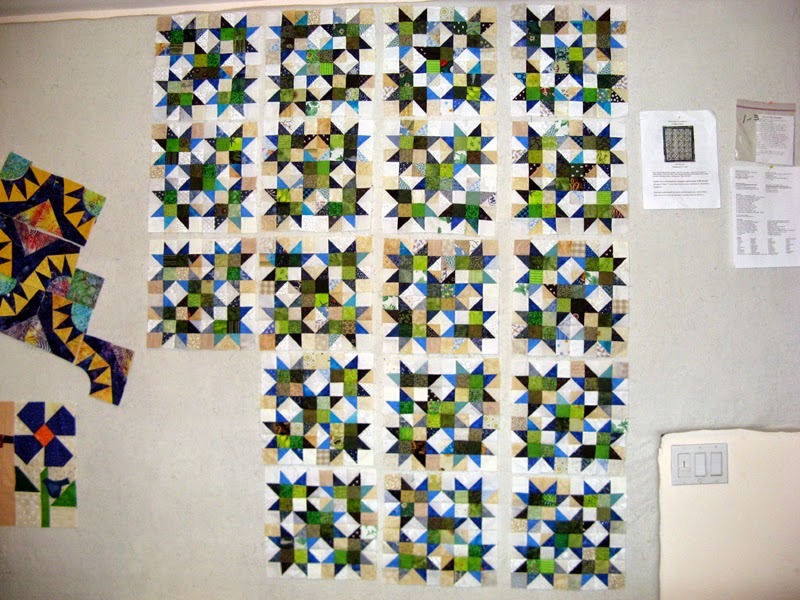 I had enough of HSTs complete to make the other seven blocks. Yesterday I spent time trimming more HSTs which puts me back to chain sewing today. 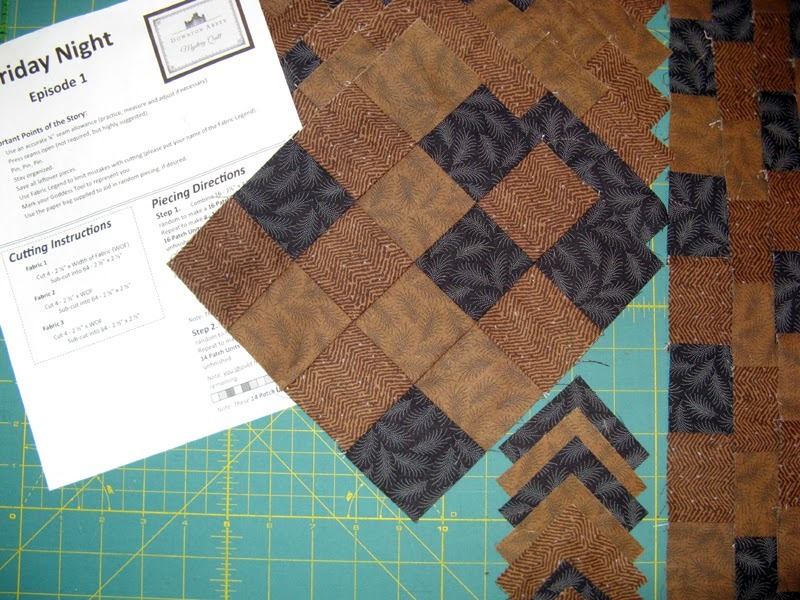 I haven't been counting so we will see how far into the 20 required blocks I can get before the next batch of HSTs need to be trimmed. 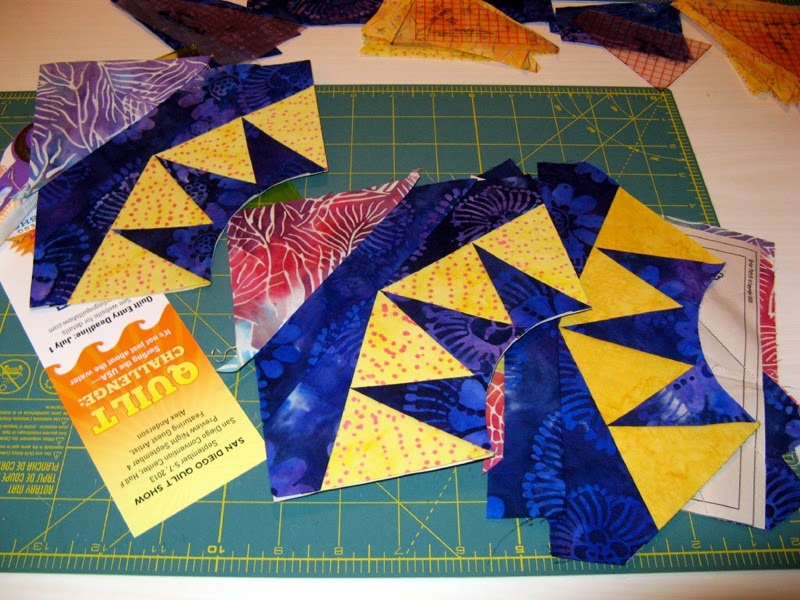 Nearly all of my HSTs are from bonus triangles. I sure am happy Bonnie Hunter enlightened me on this neat trick. 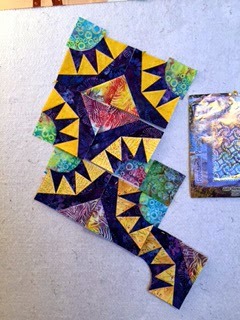 I have all kinds of bonus triangles in various neutral/color combinations most of which will finish at 2". They do come in handy with many patterns. Here are my first week stats. I'm looking forward to an incredible year of fantastic projects that start and hopefully finish from my stash. 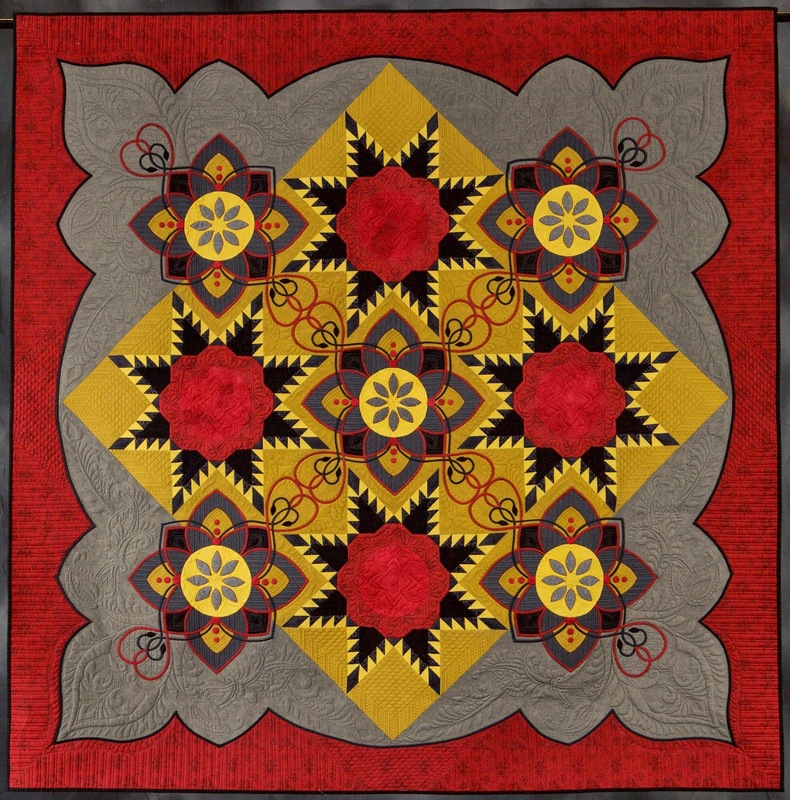 See more stats this week as quilters are using their fabrics through the links at Patchwork Times.